Science fiction is a genre of literature focusing on space travel, science, technology, and how the world will look in the future. While some science fiction takes on controversial topics, and in some cases, has correctly predicted the future, other works of science fiction just focus on a subject many people enjoy. Children's science fiction covers the same range. While many books for younger kids focus on the fun side of science fiction, books for older kids start to tackle some of the big issues in science and predict the effect they could have on our future world. These science fiction novels have stood the test of time, entertaining kids for generations. Kids who enjoy science will appreciate the futuristic and scientific societies, as well as the scientific principles covered in these stories. 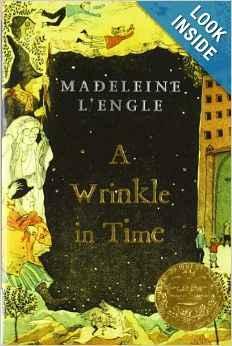 A Wrinkle in Time by Madeleine L'Engle won the Newbery Medal in 1963, and since then, has become many kids' first introduction to science fiction. The story follows Meg Murry and her family as they search for her father, a scientist who had been working with tesseracts, or wrinkles in time. Ender's Game by Orson Scott Card has the benefit of being written by one of the top science fiction authors. It also won the two top science fiction awards, the Hugo and Nebula awards. Published in 1985, the book takes place in the head of Ender, a boy chosen to attend the Battle School for military training, and follows his thoughts as he and his siblings help defend the Earth against an attack by an enemy alien race. The Giver by Lois Lowry takes place in an idealistic society without any problems or suffering. However, Jonas, the main character, soon finds out everything in his society may not be as perfect as everyone thinks. This book won the 1994 Newbery Medal, was named a School Library Association Book of the Year, and received numerous other awards for its ability to make young readers think. The Little Prince by Antoine de Saint-Exupery was first published in French in 1943 and has since become a classic tale that has inspired the names of comets and numerous literary awards around the world. Part fantasy and part science fiction, the book itself follows a time traveler from an asteroid as he lands on Earth and begins to interact with a world full of grown-ups. While The Hunger Games may top the list of popular science fiction series, the series isn't the only one to grace the science fiction market. In fact, some of these other series may rival The Hunger Games for the title of the top sci-fi series for older kids, while others have been written with younger readers in mind. 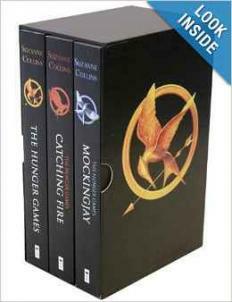 The Hunger Games, a three-part series by Suzanne Collins, has spiked many kids' interest in science fiction. This series follows the main character, Katniss, as she fights in the Hunger Games and interacts with those she encounters during her life in Panem, a dystopian society. First published in 2008, the series has since been turned into a series of blockbuster movies, translated into over 20 languages, and was named one of the best books of 2008 by Publisher's Weekly and the School Library Journal. The Commander Toad Series, written by award-winning author Jane Yolen, contains seven different books. Designed for younger sci-fi readers, ages four through eight, Commander Toad follows the commander and his crew on the "Star Warts" as they travel through space and get into intergalactic trouble. The Maze Runner Series by James Dashner has become a top-selling science fiction series for kids. The first book introduces readers to Thomas, who wakes up with no memory in a world full of boys, and receives a message from the first girl to appear which says, "Remember. Survive. Run." From there, the series takes off and its nail-biting suspense has led it to be named an ALA Quick Pick for Reluctant Young Readers. The Books of Ember by Jeanne DuPrau tell about a city encompassed by darkness, aside from when the electricity is turned on. As the lights in the city begin to go out, people begin to wonder what else is out there, beyond the city. The first book in the series, The City of Ember, has won numerous awards, including being a readers' choice award winner in multiple states. 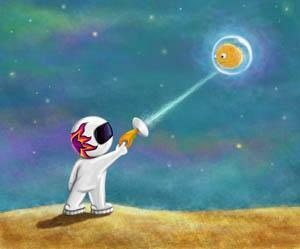 Reading science fiction to younger kids helps develop an interest in science. It also gives them a chance to read about space, aliens, and some of the other science-based creatures and settings they love, as well as look at the awesome pictures that accompany the stories. 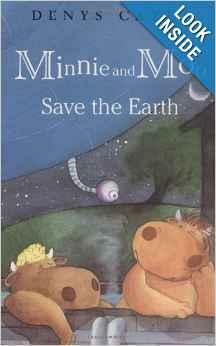 Minnie and Moo Save the Earth by Denys Cazet introduces kids to two cows, Minnie and Moo, who spend an evening contemplating whether they're the only intelligent life in the universe. Soon aliens land on a hill nearby and hilarity ensues. While not an award-winner itself, the author has won a California Young Reader award for other books. Baloney (Henry P.) by award-winning author Jon Scieszka and Lane Smith introduces kids to Henry P. Baloney, an alien from another planet who has the same kind of problems, and faces the same kind of adventures, as most kids. The book earned a Parent's Choice Gold Award for its imagination and creative graphics. Here Come the Aliens by Colin McNaughton has been featured on the show, Between the Lions, used as part of numerous children's book clubs, and was awarded a Chickadee Award. The book hooks kids with zany illustrations and a simple premise: aliens are coming to Earth and they want to destroy the human race. If You Decide to Go to the Moon by Faith McNulty uses the second-person to engage kids in a story about preparing for and taking a trip to the moon. As kids read this award-winning book, they learn facts about the moon and they also learn the most important lesson -- how to get back home. While some science fiction novels have a light-hearted tone, many of them aren't afraid to tackle the big issues. As kids read these novels, they'll be introduced to controversial topics such as cloning and the effects of computers on society. 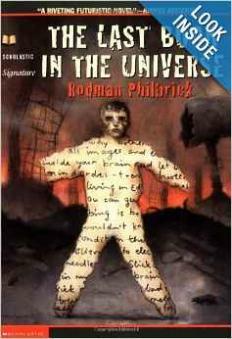 The Last Book in the Universe by Rodman Philbrick follows Spaz, a boy with epilepsy who lives in a futuristic society where mind probes and other technology has been ruining everyone else's memory. Written by the same author as the award-winning book Freak the Mighty, this book has also won it share of awards, including being named one of the 100 Best of the Best Books of the 21st Century by the Young Adult Student Library Association. Attack of the Fluffy Bunnies by Andrea Beaty offers a lighter read for young science fiction fans. This award-winning book follows two kids as they encounter three alien rabbits, also known as Fluffs, who take over their summer camp. The House of the Scorpion by Nancy Farmer tackles the issue of cloning, centering the story on Matteo (Matt), a clone of a drug lord named El Patron. He escapes, but faces many adventures and imprisonment as he learns more about himself and his identity as a clone in this award-winning book. Notable honors include winning a National Book Award in 2002 and the Newberry Medal in 2003. My Teacher Is an Alien by Bruce Coville focuses on three kids who discover that their teacher is actually a humanoid who is planning to invade the world. The book has won many state awards for children's literature, including the Connecticut Nutmeg Award and the Pennsylvania Young Readers Award. While not all science fiction is based in real science, the majority of it has been written with key scientific principles and concepts in mind. As kids read science fiction, they'll begin to make connections between what they read and what they've learned in science class. This will help improve their knowledge of science and perhaps inspire them to think critically and creatively as they improve their scientific knowledge or conduct new scientific experiments.